Bill Gates has revealed that he played an instrumental part in Microsoft buying Skype, recommending that board members support the takeover. Microsoft bought Skype for $8.5 billion earlier this month – the biggest acquisition in the history of the company. It seems fitting then, that Bill Gates was involved in buying the company. Speaking to the BBC about the buyout, he said that the deal was a great one for the computing giant. "I was a strong proponent at the board level for the deal being done," said Gates. "I think it's a great, great deal for Skype. I think it's a great deal for Microsoft. According to Gates, the Skype takeover was definitely a strategic decision – given that video over the internet will become more and more prolific, especially with the rise of bandwidth speeds and the addition of things like HD. "The idea of video conferencing is going to get so much better than it is today. Skype actually does get a fair bit of revenue," explained Gates. "It'll be fascinating to see how the brilliant ideas out of Microsoft research, coming together with Skype, what they can make of that." 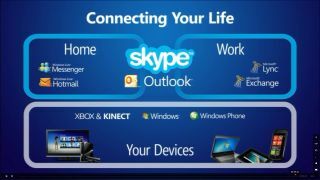 Speaking to TechRadar, Microsoft hinted that we should Skype in the next iteration of Office.